I am ever so annoyed with some people these days who claim that they're wise beyond their age, while what they REALLY have is OLD look beyond their age, with wisdom of an INFANT!!! AND WHAT IS MORE ANNOYING, THEY ARE SUCH DRAMA QUEENS!!! Who whine about trivial things.. about the so-called unfairness they had to endure, while (if ONLY they had enough INTELLIGENCE to look harder), IT IS THEIR OWN F*CKING STUPIDITY that caused the troubles in the first place!!! These obnoxious people go around parading, saying outloud to the whole world about how good and high-quality they are, while what they really have in their heads are FART GAS!! And I guess due to their UTTER STUPIDITY, their lack of manners is understandable (though annoying like hell).. Their pea brain cannot seem to convey message to their filthy mouth to speak politely to others.. It makes you so vulnerable. It opens your chest and it opens your heart and it means someone can get inside you and mess you up. You build up all these defenses. You build up this whole armor, for years, so nothing can hurt you, then one stupid person, no different from any other stupid person, wanders into your stupid life... You give them a piece of you. They don't ask for it. They do something dumb one day like kiss you, or smile at you, and then your life isn't your own anymore. Ruth: Love takes hostages. It gets inside you. It eats you out and leaves you crying in the darkness, so a simple phrase like "Maybe we should just be friends" or "How very perceptive" turns into a glass splinter working its way to your heart. It hurts. Not just in the imagination. Not just in the mind. It's a soul-hurt, a body-hurt, a real gets-inside-you-and-rips-you-apart pain. Nothing should be able to do that. Especially not love. “Lalu bapakmu akan berkata, bintang tak pernah secantik tampakannya, tak sedekat yang kita duga. Ia cuma penghias panas malam para pemimpi. Tapi aku mau terbang. Aku mau menyentuh bintang. Jika ujung jariku melepuh, akan kubelah lima. Dan pulang dengan sepasang tangan berjari lima puluh"
So today, during lunchbreak, i went to ITC Kuningan to get Gina. 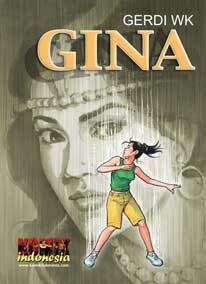 They said that they will try to re-print Gina's other (old) episodes.. Can't wait.